[...] even Democrats in Kentucky are expressing outrage at the Lexington Herald-Leader’s decision to run an editorial cartoon comparing Matt Bevin’s children to terrorists. The cartoonist, Joel Pett, was reacting to Matt Bevin’s call to curtail the influx of Syrian refugees. 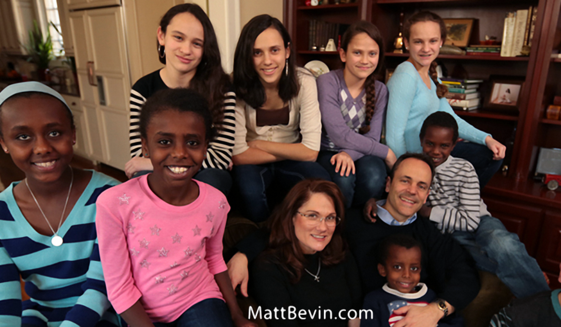 Bevin has multiple children adopted from overseas and regularly conducts Christian mission trips to Africa. Damn those are some ugly kids. The entire back row looks like it is about to participate in a documentary on the struggles of transgender youth in American schools. Just how many of those 4 were born male, do you suppose? Meanwhile, the entire front row of shitskin chilluns is grinning like it just finished eating a neighbor family in South Sudan. Now that's how to be offensive! 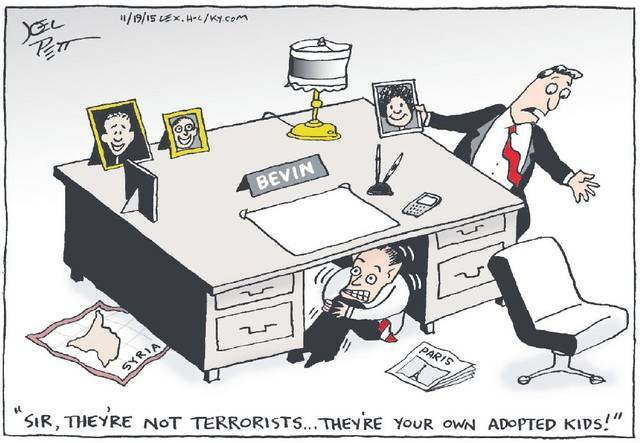 Contrast that to the first cartoon, which makes a rather confused attempt to characterize Bevin's resistance to Syrians as a product of his racism, while admitting that his own family is filled with the dregs of subhumanity. It doesn't really work. It's cheap and it falls flat. The outrage it generated is out of proportion with its worth as a source of outrage, and relies on a slight of hand trick - swapping a racial interpretation for a terrorist interpretation. Saying that the children are being accused of being terrorists and that such an accusation is outrageous, doesn't make any sense, but Erickson tries it anyway. Only a racial interpretation of the cartoon makes sense, as the Washington Times admitted when it framed criticism of the cartoon here. Now for some constructive criticism - To be more effective, the cartoon should have tried to link Bevin's views to Islamaphobia, and it still could have done this while using the children and taking a swipe at Bevin for being a closet-racist with a White Savior Complex. Draw the square with someone questioning Bevin's resistance to Syrian immigrants in light of his own outstanding humanitarian credentials as an adopter of foreign children. Have Bevin respond that the case is different because his adopted children are Ethiopian Christians, the kind of brown people God likes.